After a stretch of making exclusively improv quilts, sometimes I crave a simple, traditional project. 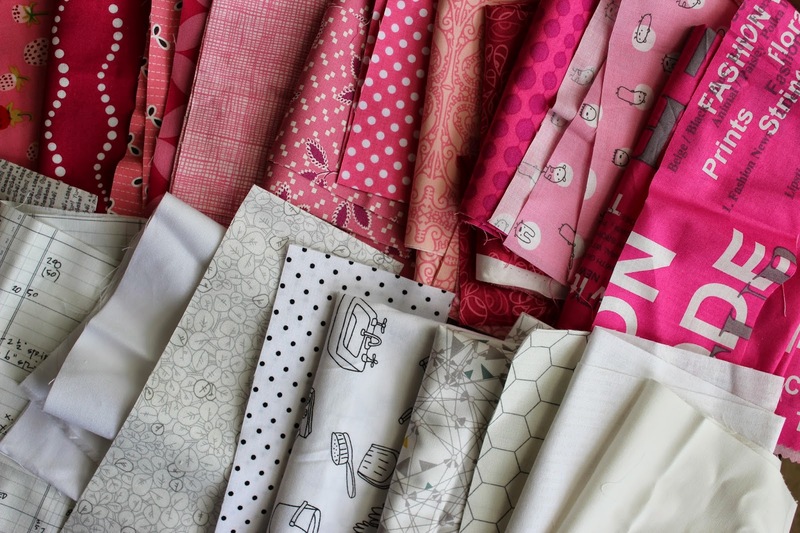 My pink and neutral scraps bins have also been getting rather full, so I started searching for a single block I could make, using just two fabrics in each block, featuring the pinks as the primary shape. 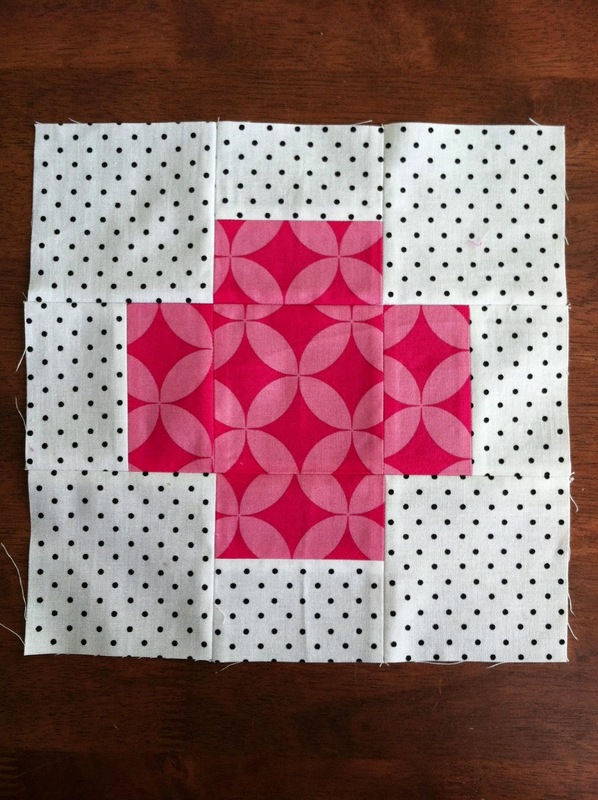 I settled on this cross block, a simple variation of the nine patch. My blocks finish at 9 inches. 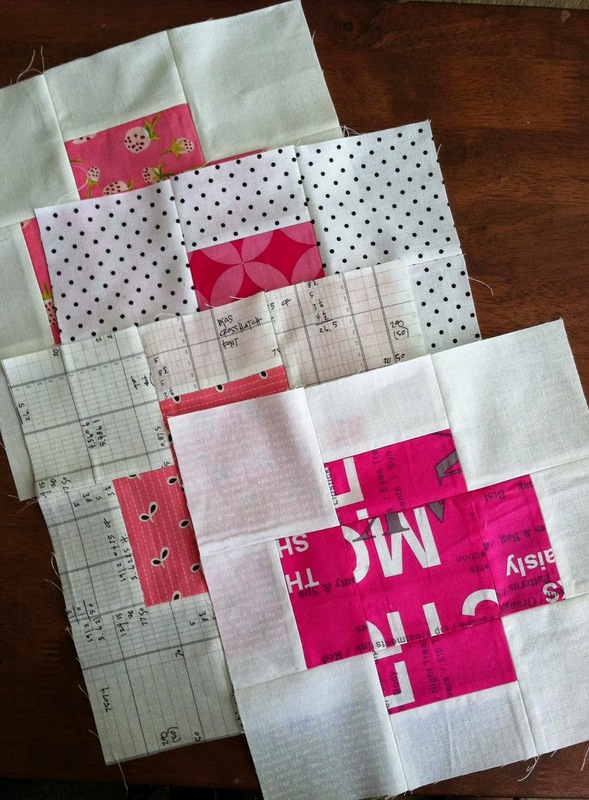 The pieces are quite small, making them perfect for using scraps! 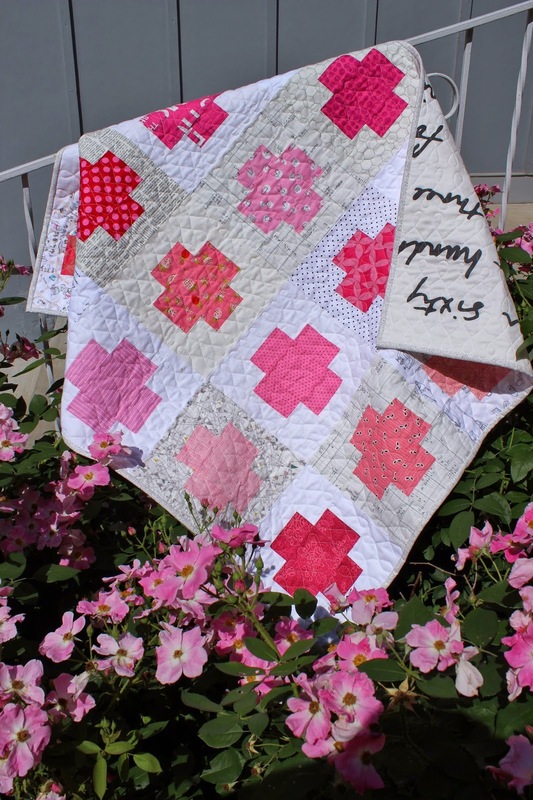 If you are looking for a pattern, you can find a similar block in issue one of Love Patchwork and Quilting designed and made by Holly DeGroot of Bijou Lovely. 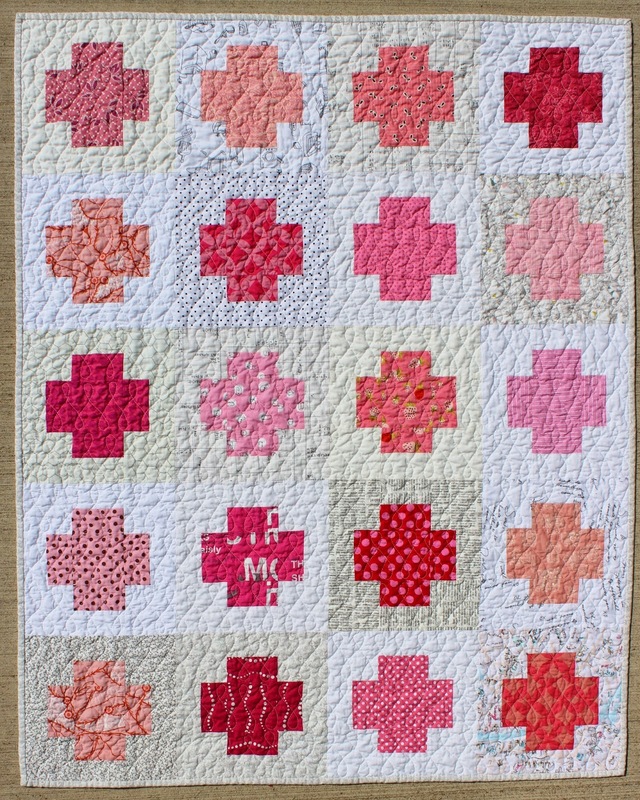 I had a lot of fun pairing each pink scrap with the neutrals, and the blocks are very quick to piece. I chain-pieced about four at a time. 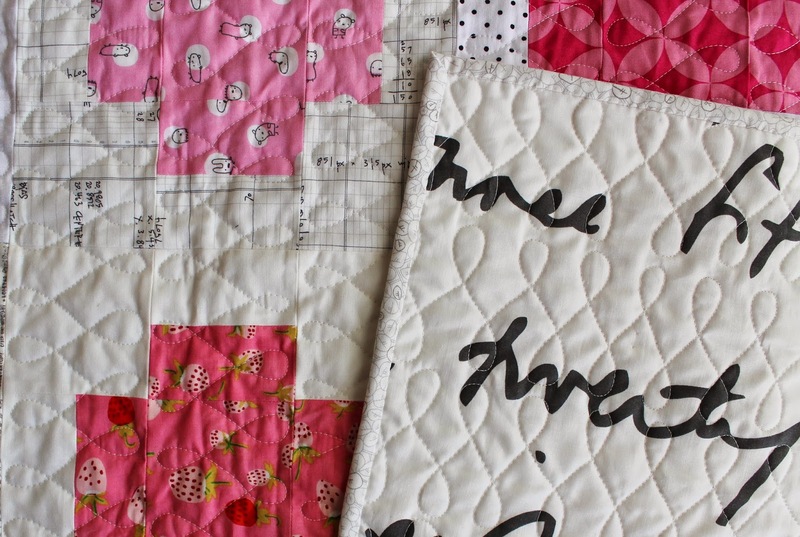 I quilted figure eights across each row. Three inches was a very easy size to create, and the rows make for a clear horizontal guideline. 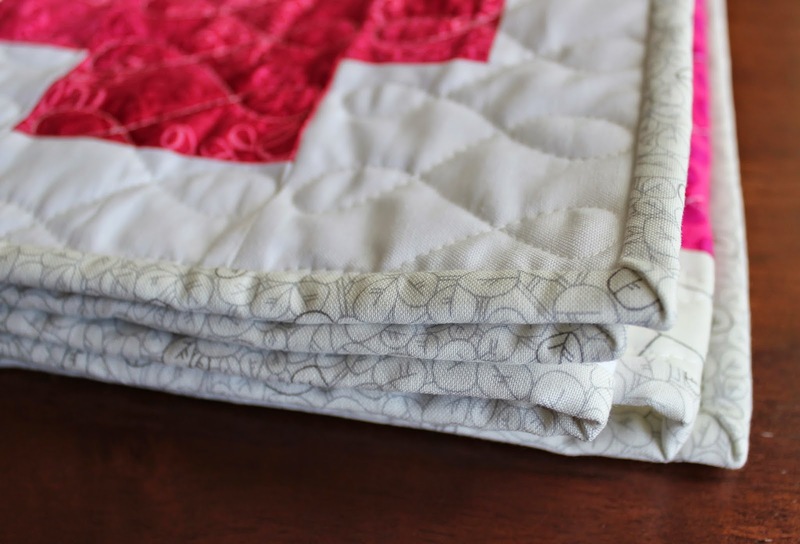 I definitely recommend this free motion quilting design, particularly if you have seams to guide you. Very speedy! The backing is a very popular print from Ikea which is particularly useful because it is about 60 inches wide. Sadly, I believe it has been discontinued. The binding is one of my favorite prints from the Botanics line by Carolyn Friedlander. I really want a bolt of it. I think it would be fantastic as a background, in the place of a white solid. 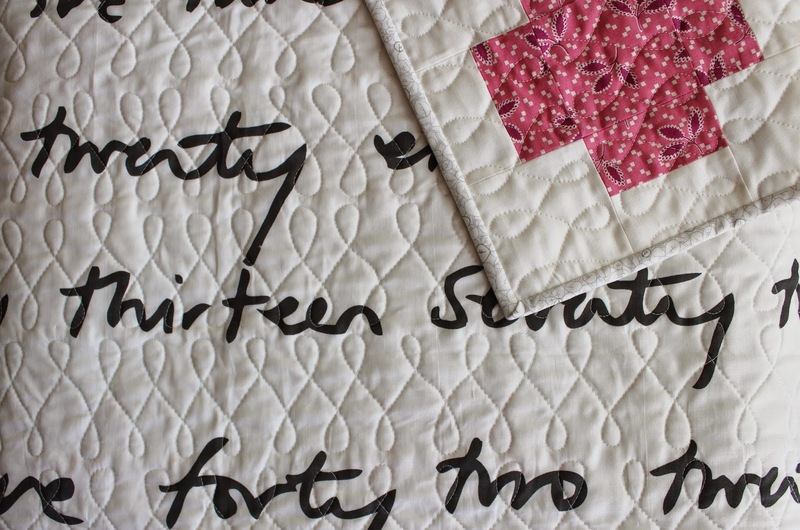 This 36 x 45 baby quilt is destined for my etsy shop. 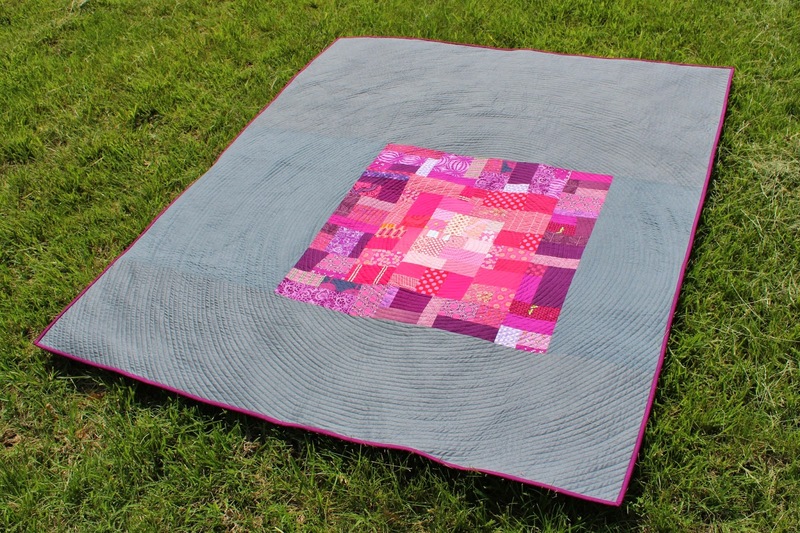 This quilt began as a pile of monochromatic strata. 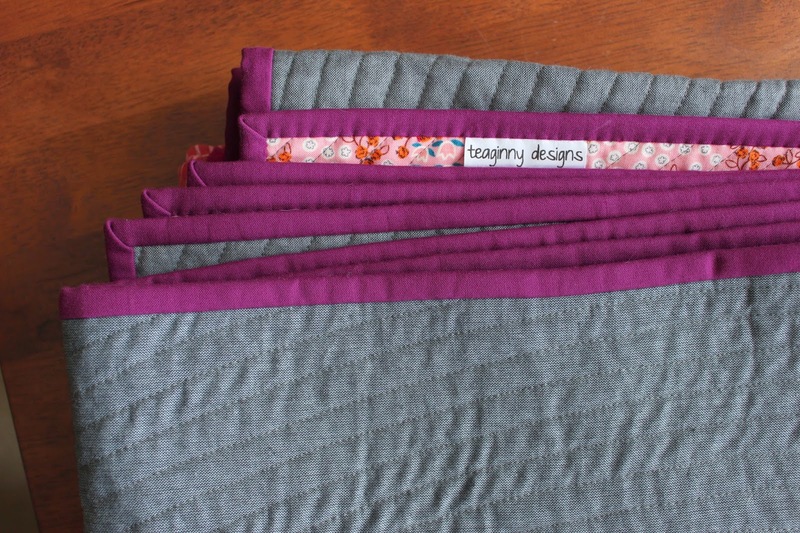 I often sit down and create strata (improv, crazy pieced units) out of scraps when I need a bit of mindless sewing. 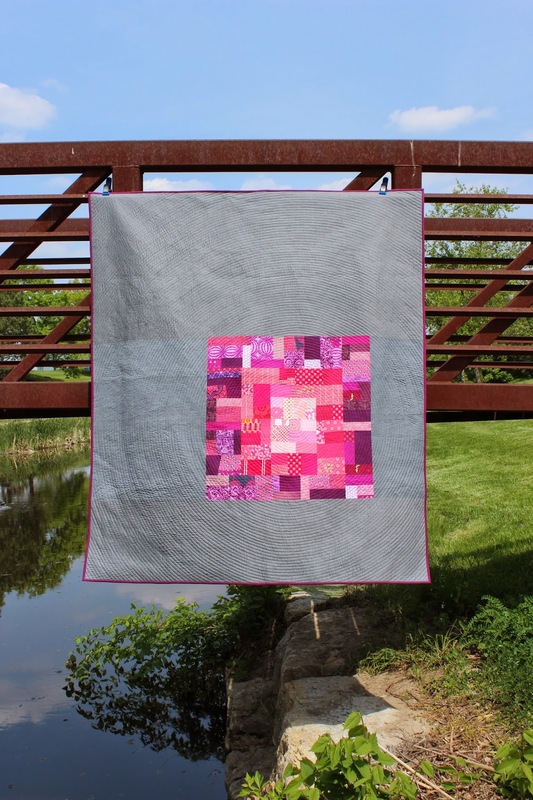 I added dark pink units around the lighter pink center rectangle, log cabin fashion. The unit grew to include a final round of purple. I decided to make a quilt, as the unit was too large for a pillow. 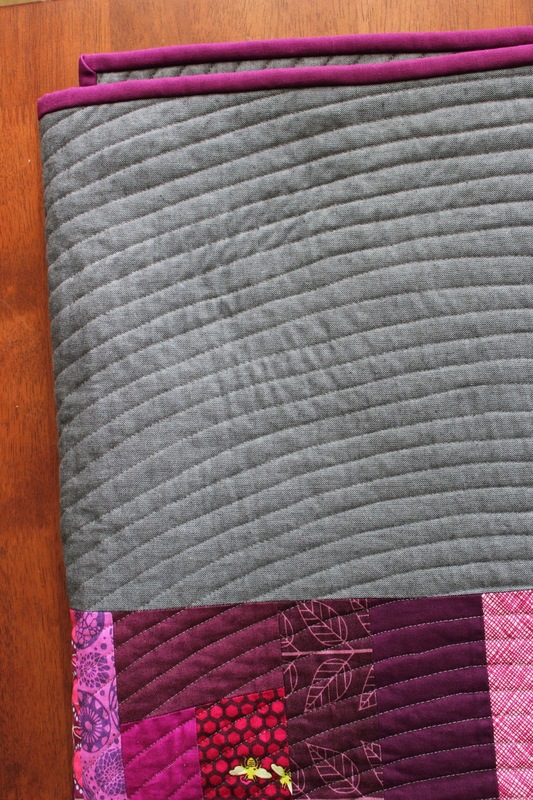 A large amount of negative space, using peppered shot cotton in charcoal, provided a nice space for some interesting quilting. I used matching aurifil thread and my walking foot to create a spiral from the center of the strata unit, outward. I absolutely love the hand of the peppered shot cotton. You can see a bit from the photos, how the warp and weft vary slightly from one another, since I cut the side and top borders the same way. The warp and weft show slightly differently. If this bothers you, pay attention to keeping the warp and weft oriented consistently in your border strips. Shot cottons have a looser weave, in most cases, than quilting cottons, and in my experience can shift more when quilting. 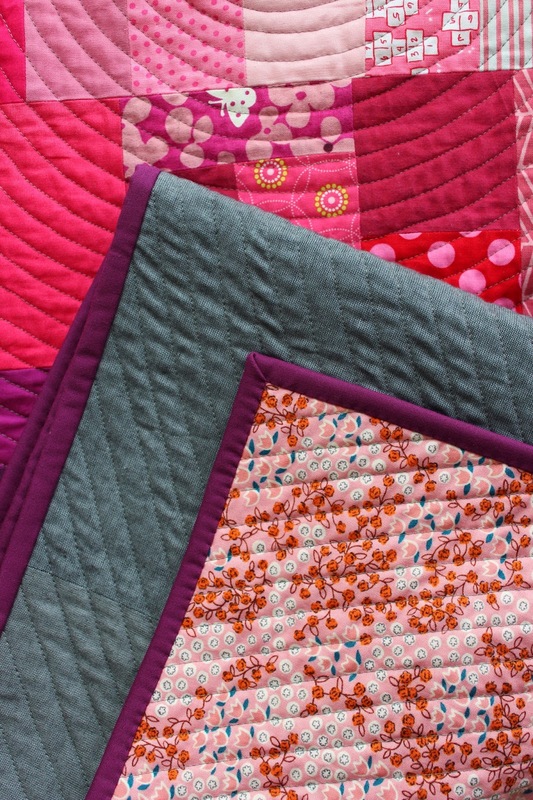 As you may know, spiral quilting using a small home sewing machine requires a great deal of pushing and pulling through the machine throat and can result in a bit of distortion in a loosely woven fabric, especially if the quilt back is a quilting cotton which does not shift quite as much. Even with some re-basting and unpicking, I ended up with some small tucks on the back of the quilt. 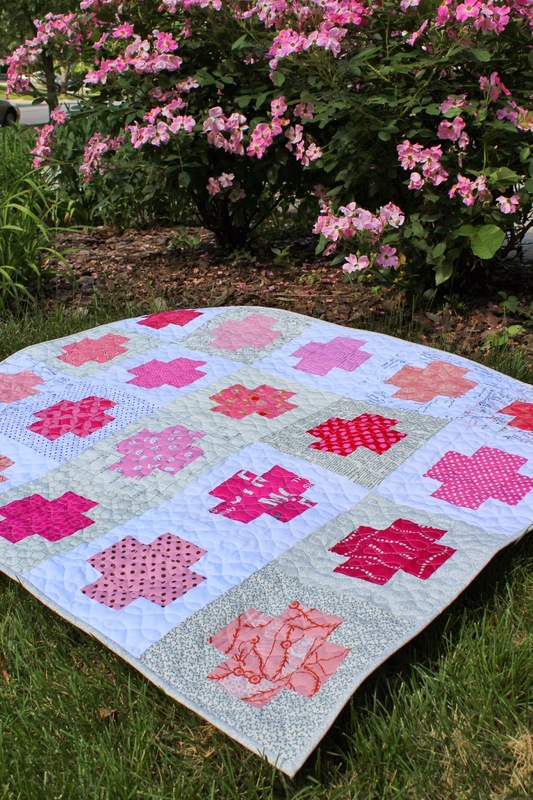 I have done spiral quilting on largish quilts, like the Tiny Log Cabin quilt, with no problem, so I surmise it the shot cotton made the difference. 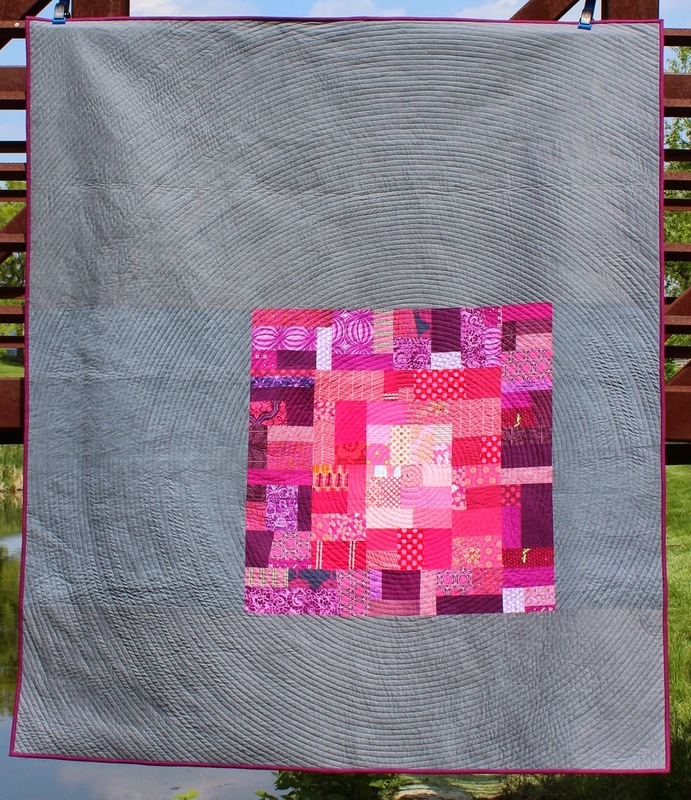 I think straight-line in a single direction or free motion quilting would have gone over much better, but the manipulation required by spiral quilting a large quilt (60 x70) was not the best choice for the peppered shot cotton fabric. Lesson learned, and hopefully someone will benefit from my experience. 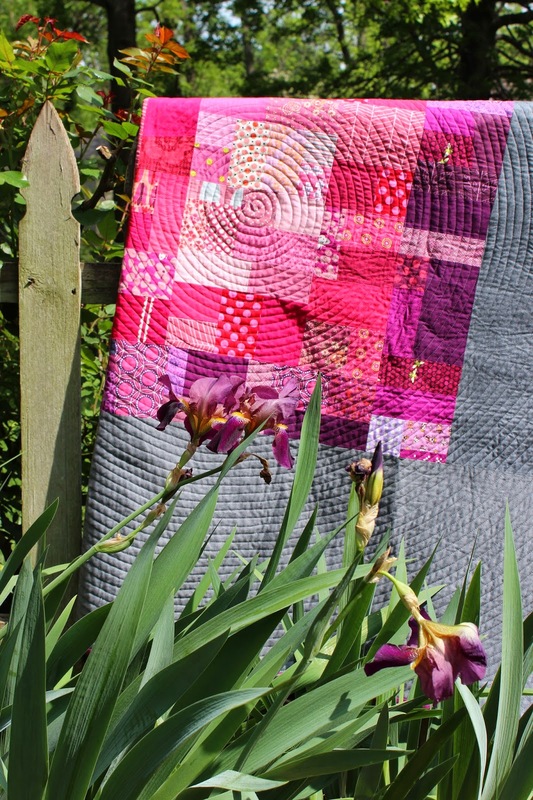 The upside is that I get to keep this quilt! I hope to use is as a sample for future classes on monochromatic strata piecing. 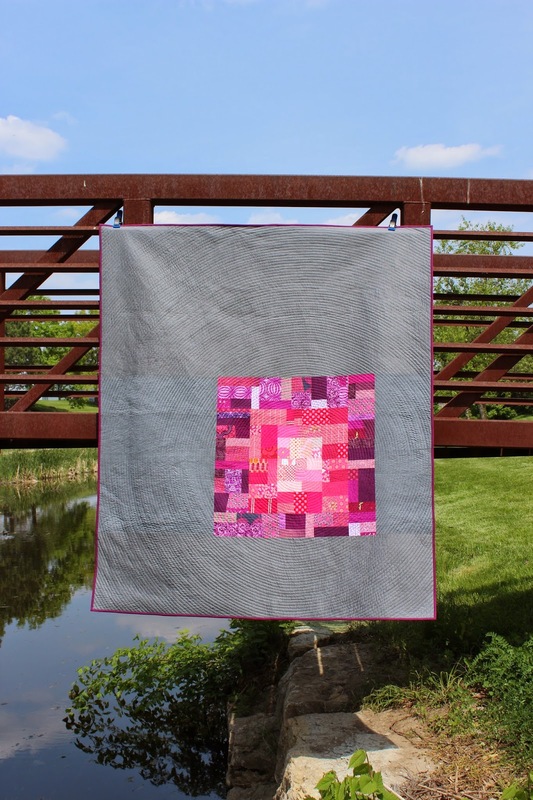 I'm linking to the Blogger's Quilt Festival for the first time. Check out the link for so much inspiration.